Saves wear and tear on your air hose. Use hose at end of paint gun or any air tool, from piping to foot pedal, or replaces hose from foot pedal to power gun in Skat Blast Cabinets. 250-300psi. 3/8" ID with 1/4" male pipe threads on each end. Available in two sizes. It helps to have a short length of air hose when using air tools. 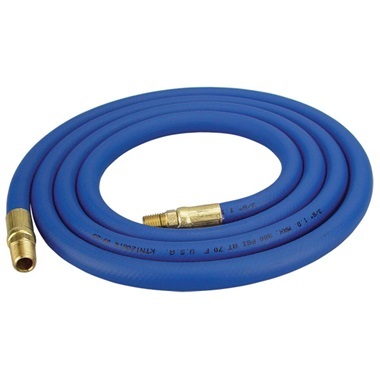 Some call this a whip hose, as it is nice and flexible. They use packing tape to wrap it and the tape leaves adhesive goo all over it which gets on your hands and attracts dust and dirt. You should not have to use adhesive remover and degreaser on something as soon as you pull it out of the package. After looking in my hometown of 25,000 and unable to find what I was looking for I am thankful for TP Tools having the product available and in stock! I use this to connect a blast cabinet to my hard air lines. It is very flexible which made it easy to route.